Did you know there are numbers of people out there who believe that the earth is flat? Well, We’ve grown up learning the earth’s shape to be a sphere. However much to our surprise, there are people who think that the earth is flat like a plane disk. There is a whole community originated consisting of a remarkable number of people. Now the question is why? 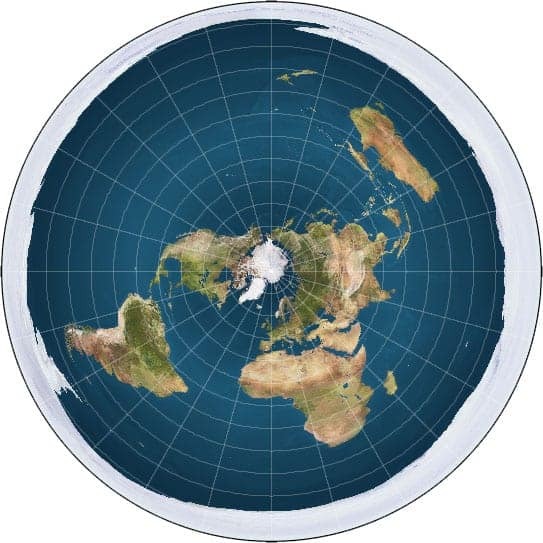 On what basis actually people believe the earth to be flat rather than a globe? Just for a while, Consider yourself to believe in the flat earth. Imagine this Earth is a round plate, the first question will arise in your mind would be what’s in the other side of the edge of that plate. Now, Flat earthers have their own theory to this question; some may find it ridiculous. They believe there is a wall of ice which is being guarded by NASA to prevent people from climbing over that wall. Well, Flat-earthers don’t think gravity really exits. As usual, they have developed their own theory. Instead of attracting things downwards the flat plate accelerate upwards conducted by a mysterious dark energy. They strongly believe that if gravity really existed, it would be so hard for fishes to swim through such forcefully held water. Everything seems to be a hoax or conspiracy to the flat earth believers. Everything NASA says or does is a conspiracy. The photos are taken of the earth are believed to be photoshopped. In a nutshell whatever science has invented till date is a lie to them. Now definitely the question comes why would NASA do this conspiracy? Well to the flat-earthers the reason behind this may be financial. And how it is financial? Of course, it is much cheaper to fake a space program than originally having it. This is the name of a book written by Samuel Birley Rowbotham. He wrote this book about his decade-long research of Earth being flat. Rowbotham’s formula which he named Zetetic Astronomy explains that earth is flat. Rowbotham never explained his astronomy in an adequate manner. Therefore you can easily assume what has been the most influential clinch to the flat Earth believers. The Zetetic method says if you feel the earth to be flat, the earth is flat. It needs no scientific explanation or clarification for believing it, which may sound a little bizarre to the scientists and the people who believe the earth to be a sphere. Besides science another book they believe to be defending the flat earthers is the Bible. They strongly believe that the Bible has mentioned the earth to be flat. With the help of internet people are conflicting over this issue. It is said that the Bible explains an immovable earth. Here is a verse “He has fixed the earth firm, immovable …(Psalm 96:10)”. With obvious reasons here immovable means plane/flat to the flat-earthers. However when the Bible has such speech as “the four corners of the Earth”, does it mean the earth is a square? We all know the mechanism of day and night in a earth shaped round. You may wonder how day and night appear in a flat earth. Of course, flat earth believers have a simple solution for that too. Luckily they believed the moon and sun are sphere shaped. Imagine a disc plate, now place a point light above that plate and move that light in a circular way. This is how the sun appears. Now the moon will appear in the same way from a different place. See this is how day and night are still possible in flat earth. You’ll be surprised knowing the fact that belief of a flat earth gone too viral when celebrities started joining the flat earth club. From basketball player Kyrie Irving to rapper B.o.B believes in plane earth theory. It has kicked up a storm on Twitter and other social media. How do We Know the Earth isn’t Flat? As round earth believers, we’ve known for centuries earth is round. We’ve so many theories to prove that the earth isn’t flat. Proving the flat-earthers wrong is so easy. Though it took 100 of years to prove that the earth is round in first place but what scientists were missing before that was gravity. If you observe a ship closely you’ll see the bottom is being vanished first and then the top part, as it is sinking. That happens because the earth is curved. A few years back Discovery has experimented with a laser beam. It crushed the plane earth theory. For a while just imagine that the earth is a flat plate. If the earth was really a flat disc it wouldn’t differ much from now if you stand in the center of the plane earth as spherical earth is attracting everything with the same force in the center, but if you start moving toward the edge it would start attracting you to the center sideways. That way sports would be really difficult on a flat earth. Have you ever poured water on a ball, it doesn’t stay on, right? But what if you use a plate instead of a ball? The water will stay on that plate. So, Of course, the earth is flat as it holds the water in it. Because of the internet and social media, this rival will continuously grow up. Flat earth believers will have their own made up theories to prove the fact. However, We have to think about the facts and theories carefully. After reading the article what do you think? Is earth actually flat?